Why don’t patterns spell out how to increase or decrease? If it’s in stockinette I’m fine with this, but a pattern stitch is maddening! It seems a bit lazy to say, “staying in pattern.” I’m working a pattern that has k2, p2 rib, so what am I supposed to do? How can I stay in pattern? Won’t adding or subtracting a stitch make me go off the pattern? I get cables—if I don’t have enough stitches I just don’t do the cable. But I can’t shape in lace. It makes my head explode! Are designers just being lazy when they stick us with “staying in pattern”? Not necessarily. When it comes to cable and lace charts, the designer doesn’t know what row you are going to be on when it comes time for that shaping. Let’s be honest: when working straight for a set number of inches, most knitters work different numbers of rows. Unless the designer forces every knitter, in every size, in every row gauge to end on the same row of the chart, it’s a mess to specify exactly how to increase or decrease. It’s true, the words “staying in pattern” can strike fear and loathing into the hearts of even the most experienced knitters. But take a breath and know that having the choice in your hands is a good thing. 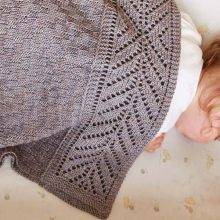 When we increase or decrease in a knit-purl stitch pattern (examples: rib, seed, basketweave, moss), depending on the number of stitches in a full repeat of the pattern, we will always go off the pattern. Then, if we continue increasing or decreasing, we will eventually come back to the pattern. 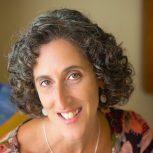 The goal is to find a decrease and increase that can blend into the pattern. 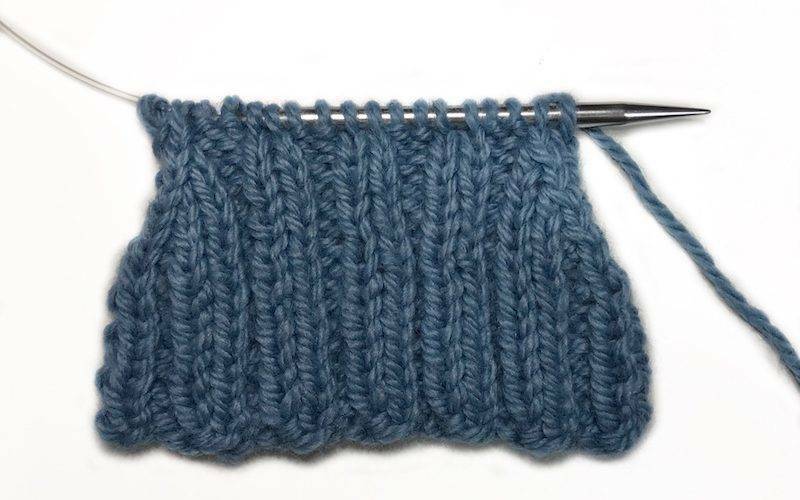 For a decrease, always consider which stitch ends up on top. (Hint: in a decrease, whatever stitch our needle enters first ends up on top.) A p2tog is all well and good to turn two purls into one purl, but it doesn’t looks so great when you have a purl overlapping a knit. 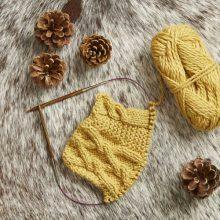 If you have more than one stitch to decrease, as in a sleeve, then the knits are your friend. You see, when purls are stacked vertically, as in ribbing, they recede. The knit stitches are raised, making them prime candidates to sit on top of purls in a decrease. Let’s take a look at your k2, p2 ribbing example. 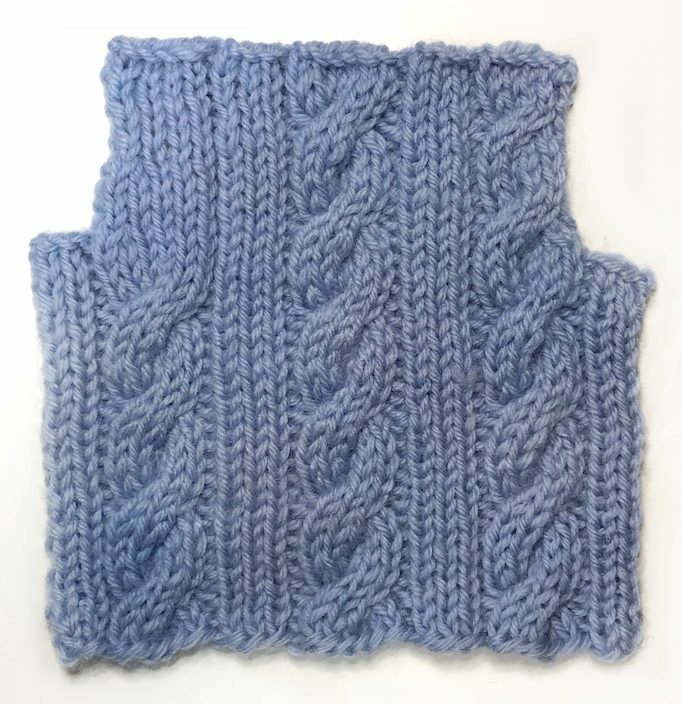 The multiple here is 4: 2 knits and 2 purls. You will leave the pattern as soon as you start to decrease, and you will not return to the pattern until 4 stitches, or a multiple of 4 have been decreased away. There are lots of ways to decrease and lots of places to put them. First decrease of one stitch at each end: K1, ssk, work in pattern to last 3 stitches, k2tog, k1. If a one-stitch decrease at each end in this manner is repeated 3 more times, you are back in pattern. Increasing in pattern would work the same way, using m1k and m1p to return to pattern. 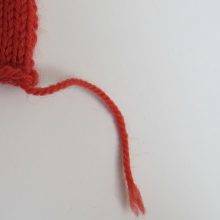 Finally, never underestimate the secretive and mysterious power of knitting through the front and back loop (abbreviated as “kfb” or “kfbl”) to increase one stitch. 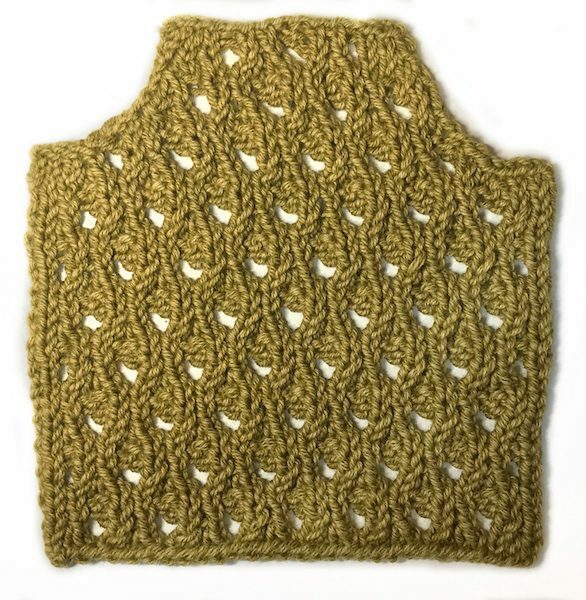 Since the kfbl visually creates a knit followed by a purl, it works wonders in seed or moss stitch, hiding in plain sight! 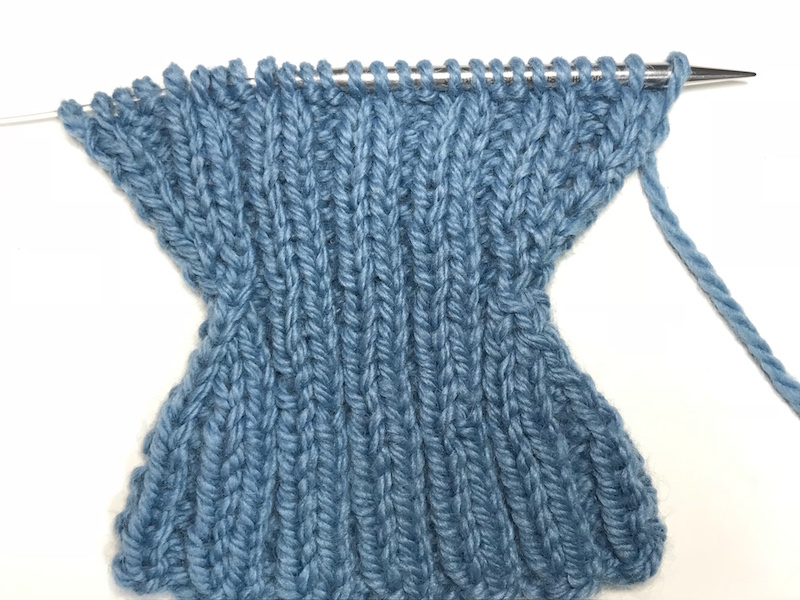 For cable patterns, the easiest way to communicate shaping in a pattern is the old “when you don’t have enough stitches to complete the cable, eliminate it.” But I say you’re better than that. I mean really, which armhole would you rather rock: the one on the left or the one on the right? 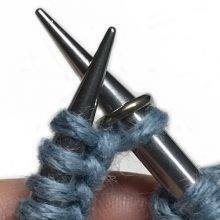 The advice your mother gave you holds true for shaping in cables: make the most of what nature gave you. If you are working a 3 over 3 cable and you only have 5 stitches, why not cross 3 over 2, only have 4 stitches, then cross 2 over 2? My favorite trick is shaping within the cable. 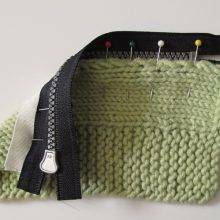 If you happen to be on a decrease row and a cable cross row, you can put your decrease in the stitches that are held on the cable needle. Things can get tricky when shaping in lace. Here, we have to deal with maintaining the lace pattern and the correct stitch count. In lace, increases and decreases are what make up the lace pattern—and at the same time, increases and decreases may be shaping the garment. The secret to shaping in lace and not setting your chart on fire is to find the yarnover + decrease pairs in the lace. 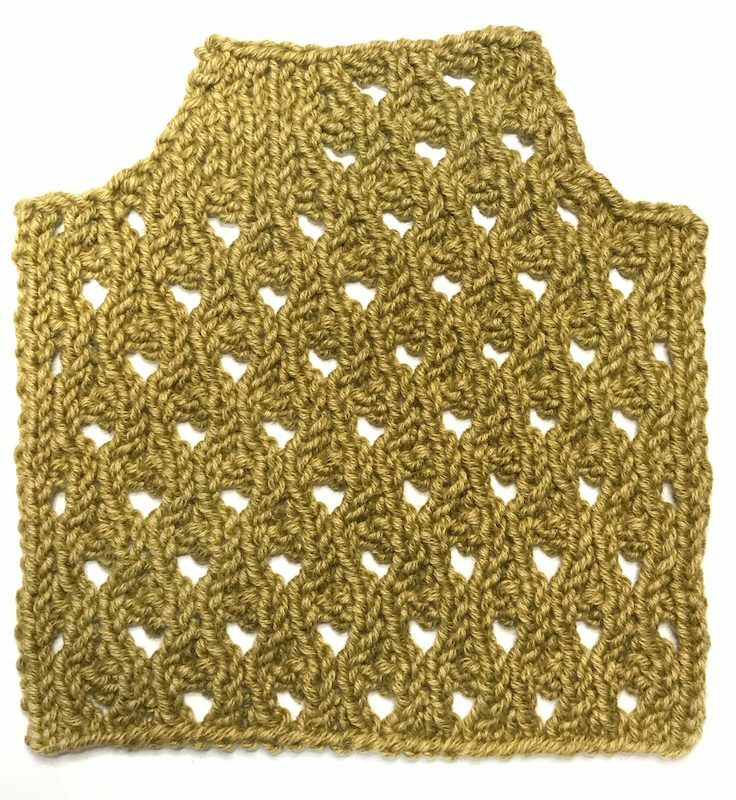 Remember, any time your shaping eliminates half of that pair, if there aren’t enough stitches to work both your YO and your decrease, you’ll replace them with your lace background stitch (usually stockinette or garter stitch). This also means sometimes turning a double decrease into a single decrease. 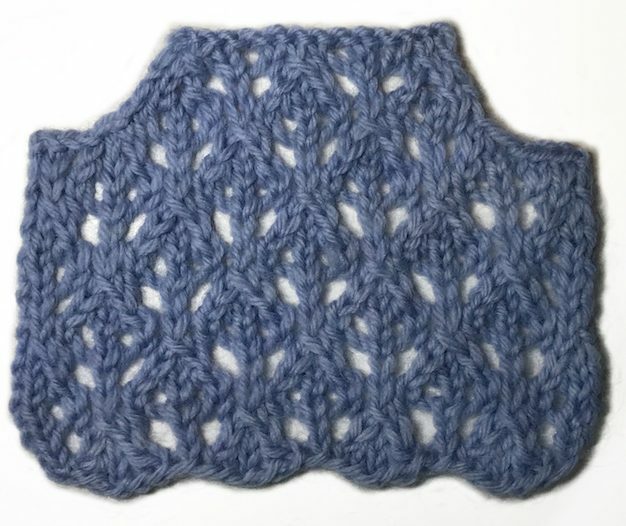 The left side of this swatch follows the dusty old advice “when you don’t have enough stitches to complete a repeat, replace with stockinette.” Blah! This is a simple 4-stitch lace repeat with a k2tog, double yarnover, ssk. SEE THE LEFT SIDE AT THE TOP? This doesn’t look so good. Here’s the same swatch but working a single yarnover when you only have enough stitches for a single decrease. Notice how on row 8 the balancing stitches are outside the repeat. 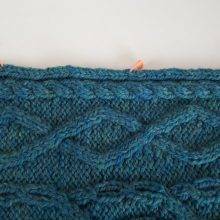 It can be helpful to draw out a few repeats of the chart when plotting out something like armhole shaping so you can see how the lace works. Here I’ve highlighted my BOs in yellow and my shaping decreases in blue, and the gray boxes show what stitches I am altering to stay in pattern AND not screw up my stitch count. The result is a visual delight! So, read your chart, read your knitting, pour yourself your favorite beverage, kick all children, pets, and other distractions out of the room, and take a breath. You can do it! I’m in a very small knitting group—three of us—and we recently decided to do a KAL. Two of us completed the top, but the third has given up because of the lace pattern at the shoulders. This is the third or fourth project she has started but never completed, and the reasons are never the same. She is a good knitter, but is there anything I can do to encourage her to complete her top? There is a special place in heaven, filled with cashmere, self-correcting lace and baby bunnies, for a knitter like you. Wanting to encourage another knitter to press on is a wonderful yet tricky thing to do. I’ve been running KALs in my Ravelry group for years. There are knitters who finish every project, and there are knitters who start each project but never make it over the finish line. What I’ve learned over the years is there are a lot of reasons, and not all are bad. First, try to suss out your friend’s reasons for quitting projects with a bit of reverse psychology. 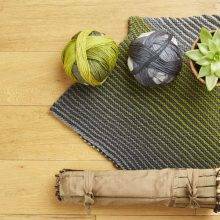 Take a few works in progress to your next knitting group, and ask your friend’s advice about completing them. For one project, make up a reason that you feel like you have to quit because it’s hard or confusing. See if your friend encourages you to keep at it or offers you suggestions on how you might be able to break through. If so, she might really be looking for help and feels like she’s the only one who “doesn’t get it.” Accept her help on your project and offer to pay her back by helping her on hers. 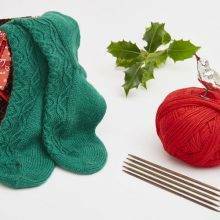 If she says “if you don’t like knitting that project, move on,” then it’s possible that your friend is one of those knitters who are in love with casting on, but the love fizzles before the bind off. If this is the case, and she doesn’t seem upset about bailing, but excited about the next project, so be it. 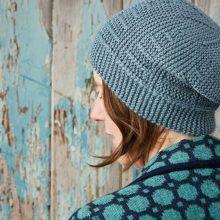 Some knitters are pure process and can’t resist the lure of the next shiny new cast on. If this is the case, perhaps your group could have a “10/10 night.” This is a fun game where you have everyone bring in one stalled project and one new project that they can’t wait to start. Everyone knits 10 rows of the stalled project and 10 rows of the new project. Suggest that you keep this going until the stalled project is stalled no more! Or . . . have a frogging party and call it a day! Stuck on a gnarly knitting problem? Our How-To category is here to help. That was very encouraging thank you. Once again, awesome information. Saved! My cousin, Kelly, knits amazingly beautiful sweaters and hats and you name it! I crochet everything under the sun. We were both taught by the same grandmother who was an incredible person, teacher and role model. Kelly has four brothers and sisters. I came from a highly abusive home. Grandma and Grandpa pretty much raised me and at age 14, I moved in with them. They were wonderful people, funny, busy, salt of the earth. Kelly and I were their oldest grandchildren. 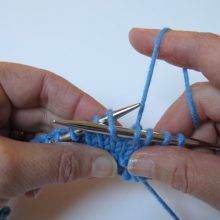 Kelly tried so hard to teach me to knit, but learning to cast on became my greatest triumph! I tried so hard to teach Kell how to crochet, but mastering the first row of single crochet became her triumph! And to this day, we oooh and aaaah over each other’s work. 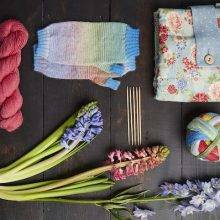 I guess the point of this ramble is that it’s wonderful that there are knitters and crocheters who can sit together over tea and laugh and work and help other people with problems. Kell became a deaf educator and I became a nurse. You strike me as someone we would love to have tea with. Thank you for the lovely way in which you correct, encourage and inspire. Thanks so much! I’d love to have tea :). Fascinating! I am not that far progressed in my knitting skills, but I will get there. I am saving this this valuable information for the time that happens. The knitted sample comparisons are a treasure. Thank you! I LOVED this!! Thank you so much for explaining all of this. Amazing! I have encountered the decrease in cables issue on a few occasions and I haven’t yet cracked the code. This is such helpful intel for my next go-round. I love the 10/10 idea. A good way to get through stalled projects. And who knows, after 10 rows of that stalled project, one might want to keep going! This is good advice. My own personal “fear and loathing” knitting instruction regarding increases/decreases is: “Repeat for other side, reversing all shaping.” I tend to walk away from patterns that say this, but writing out the reverse shaping instructions would be one way to deal with a pattern that otherwise looks do-able. First, I loved Kathleen’s comment. Second, thanks Patty, this is the Hard Stuff. You have helped me make a dent in my understanding of it. Dear Patty: thank you so much for this wonderful article! The tip “first stitch into the needle ends up on top” is forever going to be scribbled on my knitting notes from here out. The hints on increasing and decreasing in pattern inspired me to try decreasing in mosaic herringbone on my latest knitted beanie (achieved with a mix of mosaic and working with both strands) and I’m so thrilled with the results! I’m so excited! Glad I could help. I love doing “shaping swatches” to practice. It’s really helped me see over the years. Hi Patty. Thanks for the increase/decrease tips and love the suggestion for a 10/10 night. I am a process knitter with double digit ongoing projects, loving the thrill of a new cast-on. My take is that it’s good for my brain to go back and forth between various projects. Not sure if that’s accurate, but works for me. Best of all, I’m ok with that.